IOTA has been among the major cryptocurrencies since its launch in mid-2017. It is currently ranked in the top 20 cryptocurrencies by market cap and was listed in the top 10 for much of 2018. IOTA is different than most other cryptocurrencies with its underlying technology being based on a Directed Acyclic Graph (DAG) instead of a blockchain. Securing it is still as important as with any other cryptocurrency. With IOTA being a relatively recently released project as well as having a different technology, it can be sometimes confusing to know the best place to store it. Many of the top quality wallets which support other major cryptocurrencies do not have support for IOTA due to the difference in the technology. We have researched the wallets which do have support for IOTA to present the best-rated in terms of security, functionality, and usability. Hardware wallets are the most secure type of wallet for the everyday cryptocurrency user. Funds stored on a hardware wallet are mostly kept offline. The private key of hardware wallets is stored on the wallet itself making it extremely secure. Users can easily connect the device to a computer to manage their account and send transactions. High levels of encryption are applied and the funds are safe even if the user uses the device on a compromised computer. Unfortunately for IOTA holders, the vast majority of hardware wallets do not support IOTA. Up until recently, no hardware wallets supported IOTA. Fortunately, Ledger Nano S will now be supporting IOTA. On the 2nd November 2018, the IOTA foundation announced a collaboration with Ledger. The wallet will integrate with the IOTA foundation Trinity wallet enabling users to secure their funds offline while being able to manage their wallet through Trinity. The Ledger Nano S is a device similar to a USB. The device comes in a sealed package so that users know if the package has been tampered with. There are clear set-up instructions provided. Users need to take careful note of the recovery seed which can be used to recover the funds on another device in the case that the original device is lost or stolen. In addition to IOTA, Ledger Nano S has one of the widest support for other cryptocurrencies. Users can easily manage their account by linking the device with a computer and accessing a Chrome-based app. The interface provided through the Chrome-based app has a very clear and intuitive design which is good for both beginners and professionals alike. Users can manage their IOTA accounts also through integrating with the Trinity wallet or Romeo wallet. Overall, hardware wallets are the gold standard of security for the everyday cryptocurrency holder. The security features combined with the functionality leverage the benefits of both cold storage and hot storage. With the recently added support for IOTA, Ledger Nano S becomes a top consideration as a wallet. It also establishes a unique competitive advantage for Ledger Nano S over their main competitors Trezor and KeepKey. For more info on this wallet and the 713 more coins it supports you can check out our Ledger Nano S review and guide. Trinity is a wallet launched by the IOTA foundation. The IOTA foundation is a not-for-profit foundation whose goal is to drive the adoption of distributed ledger technology adoption along with the development of the ecosystem surrounding the technology. The foundation was started by the founders of IOTA. The Trinity wallet is available on both mobile and desktop. The wallet is supported on Windows, OSX, Linux, iOS, and Android. The wallet has been designed to be easy to set up and to use. Users setting up the wallet are taken through the set-up process step by step and the process is automated as much as possible to be straightforward for beginners. The wallet has a strong emphasis on security. The seed is in control of the user who encrypts it with their own password and two-factor authentication. The wallet can be used to store, send, and receive IOTA. Users can easily generate a QR code to receive transactions. There is no support for other cryptocurrencies but users can monitor the price of IOTA in comparison to other cryptocurrencies through the wallet. The wallet is professionally designed and users can intuitively navigate to all important information from the home screen. Overall, the Trinity wallet is the strongest choice for IOTA users. Being launched by the IOTA foundation has resulted in all of the primary needs of IOTA users being accounted for. There is a strong emphasis on support for users of the wallet and the wallet is available in multiple languages. Romeo is another IOTA wallet which the Ledger device will be able to integrate with. Romeo is not the optimal wallet solution for non-technical users but some in the community may find it an attractive option. The wallet operates in any browser apart from Safari. The wallet needs to be used in HTTPS to be integrated with the Ledger Nano S.
Users can get the wallet through GitHub which also updates the wallet automatically. This hosts the wallet on the Gitlab server. Integrating with the Ledger Nano S encrypts information providing an extra layer of security. Users can also save the HTML page of the wallet and upload it to their own server if they have the technical knowledge. This provides the benefits of having seed and key information in the users own server, providing an extra layer of security. Once the wallet is set up, users can use it to store, receive, and send IOTA from their browser. Users who wish to access the Romeo wallet through their Ledger device can also access it through Gitlab. Users easily switch to the Ledger Nano tab and access the wallet by inputting their device. Using Romeo with the Ledger Nano device provides far greater benefits than using Romeo as a standalone wallet. With the private key being stored on the Ledger device itself, users can access their wallet from any browser on any computer comfortably without worrying if their information is accessible to other parties. With Romeo being hosted on Gitlab, it is an open-source project and can be assessed and contributed to by the developer community. It is not the ideal wallet as there have been concerns noted about the storage of sensitive seed and private key information. It is still a valid option given the limited number of IOTA wallets available and its security is greatly increased if the wallet is used with the Ledger device. The GUI wallet is an open-source wallet available on desktops which enable users to set up a wallet to store, send, and receive IOTA. The wallet is supported on Windows, OSX, and Linux. Users need to navigate to the GitHub page to set up the wallet. Users can from there download and follow instructions to set up the latest release of the wallet. Users are advised to set up the light node unless they have technical expertise. Full nodes download the entire IOTA DAG whereas light nodes will connect to another full node and are far easier to set up. Once the wallet is set up, the interface is easy to understand and navigate. Users are in control of their own private key. The main challenge lies with setting up the wallet. If users can successfully download and set-up the wallet, it is a good option to consider for easily managing IOTA through the desktop. Exchange-based wallets are typically advised against because they represent the poorest form of security. However, they also have a number of advantages. They enable users to easily speculate within the exchange based wallet without having to pay the transfer fees of moving the cryptocurrency to and from the exchange. Bitpanda is one exchange based wallet which enables users to speculate on the price of IOTA both in relation to fiat currencies and in relation to other cryptocurrencies. Bitpanda supports EUR, USD, CHF, and GBP enabling users to speculate in the major fiat currencies. There is also a wide variety of payment options including prepaid card, depositing via bank transfer, and online payment processors such as Skrill. Users can also easily sell their IOTA back into fiat currency and cash out when they wish. 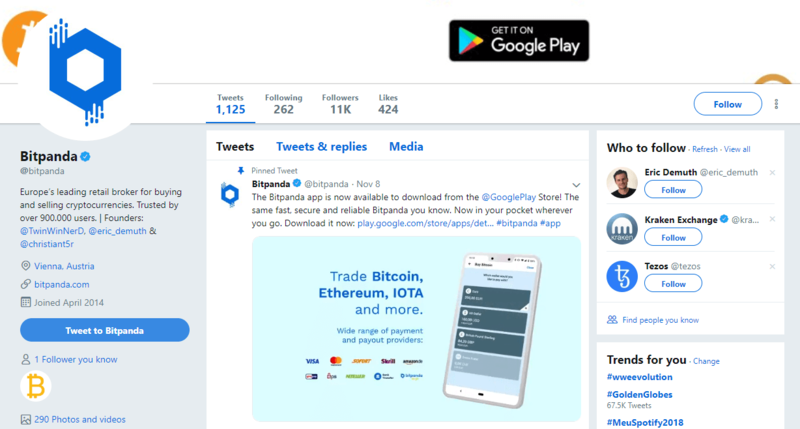 Bitpanda has been operating since 2014 and is designed to be easy to use for beginners. This is a good option to consider for users who may be confused about the other wallets or wish to hold their IOTA in a wallet which easily allows them to speculate against fiat currencies.